BadRabbit launched on the morning of Tuesday, October 24, 2017 was delivered through drive-by downloads of the fake Adobe Flash Player installer from the hacked websites. The installer came undetected with a Symantec digital certificate and 1 out of 65 detection rate on VirusTotal. The Bad Rabbit ransomware having the similar set of features and code snippets to the NotPetya wiper can be considered like its new version supposedly created by the same author. In the new version, the legitimate DiskCryptor driver used to install the bootloader and encrypt the hard disk volumes in a hidden way. The installer’s description says it is an Adobe Flash Player Installer/Uninstaller (MD5: fbbdc39af1139aebba4da004475e8839). The dropper has a valid certificate from Symantec but the wrong signature. The BadRabbit will not start if the ‘cscc.dat’ file is in the Windows folder. BadRabbit schedule a system reboot in several minutes. If the task with the same name exists, BadRabbit deletes it.Then creates a new one. The manager dispci.exe contains MBR and two versions of kernels (kernel 1 - 21162 and kernel 2 - 16718 bytes) as resources. Infpub.dat is a dll with exported functions. BadRabbit starts the first exported function. The second one is designed to run the first one, providing the input parameter as the BadRabbit dropper does. SeShutdownPrivilege - allows an attacker to shut down the local computer. SeDebugPrivilege - allows an attacker to access and modify the target process memory. SeTcbPrivileges - allows a process to authenticate like a user and thus gain access to the same resources as a user. To do that, it calculates the hash using XOR and decrement operations in the similar way that NotPetya did. The difference is in the XOR key. The Bad Rabbit has “87654321h” while NotPetya - “12345678h”. Once the BadRabbit detects McAffee or DrWeb processes, it drops cscc.dat in %ALLUSERSPROFILE% folder and does not encrypt files. Otherwise, cscc.dat is dropped to the Windows folder. BadRabbit tries to connect to a remote computer via SMB/NetBios NTLMSSP using the hardcoded list of logins and passwords. The Bad Rabbit ransomware is equipped with the EternalRomance exploit. To detect the vulnerability, the Bad Rabbit supposedly uses the Metasploit code for MS17-010 SMB RCE detection. If the service is not vulnerable, it returns “STATUS_ACCESS_DENIED” or “STATUS_INVALID_HANDLE”. Otherwise, the status will be “STATUS_INSUFF_SERVER_RESOURCES”. The file encryption is done with AES-128-CBC using the Microsoft Cryptographic Provider. The AES key is encrypted using the hardcoded RSA-2048 public key. Based on the analysis above, we can state with high confidence that the Bad Rabbit’s ‘infpub.dat’ module is based on NotPetya source code and is a new version of it. 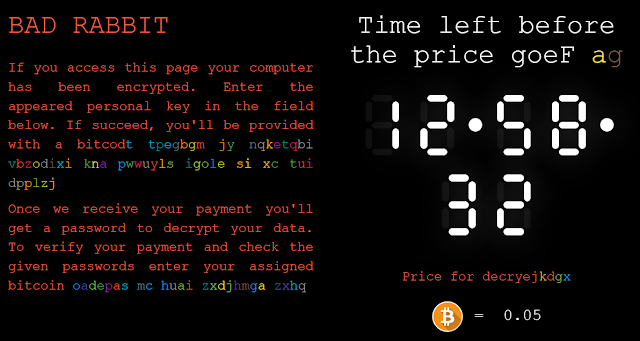 Consequently, the Bad Rabbit ransomware is written by the same author who is financially driven in the current attack. Based on the geographical diversity of the victims reported by Kaspersky Lab, we can suggest that it is not a nation-state attack. However, in the future, we can expect a new version, which can be used to attack the critical infrastructure of some state.